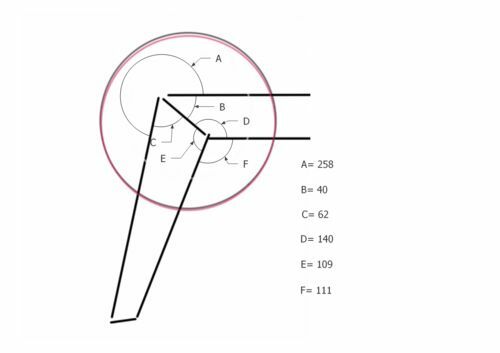 How to calculate the above angle? Thanks! I think we need a little more info. are those table legs ?? I am terrible with math, geometry, algebra and anything else that contains numbers. I just get me some cardboard and make templates – then cut from the pattern (when possible). the outside line is 103 degrees and the inside line is 113 degrees and the joint line is 62 degrees. if your drawing is drawn to scale, you could try those numbers on a template and see if the work for you. Am I missing something? There is no picture, nothing. Weird. All I see is a post asking this question with zero reference to anything. I guess my 10 year old laptop is Blessed – I see a simple hand drawing. It’s a WebP image – a relatively new Google kitchen sink image format they are trying to push on the Internet that isn’t widely supported. Chrome and Opera will (should) display them, but not many others. I look at it this way; The circumsribed angle is 113. You want to cut a miter so it will make a table leg giving a flat surface. This means that you must adjust the miter so that 90 is to 45 as 113 is to X.
It’s not clear exactly what angle you are trying to calculate. 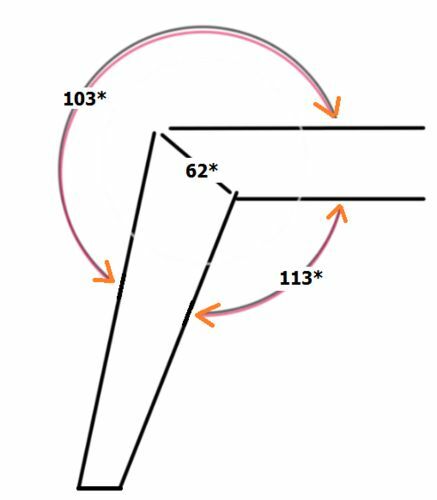 Trigonometry is the mathematical way to calculate angles from known lengths. In your case, there is not enough information to give a “calculated” angle. 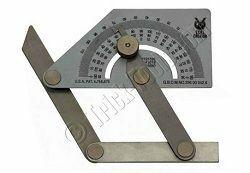 Measuring with a protractor is a way to derive angles from a drawing or object. you lost me at “then you adjust the miter”. that is why I make cardboard templates and cut from patterns. If you are trying to miter two pieces of the same dimension (at the miter), then—as I see your drawing, (which I have cleaned up a little below)—you want to be about 12 degrees off of square, or 102 degrees (90 + 12). 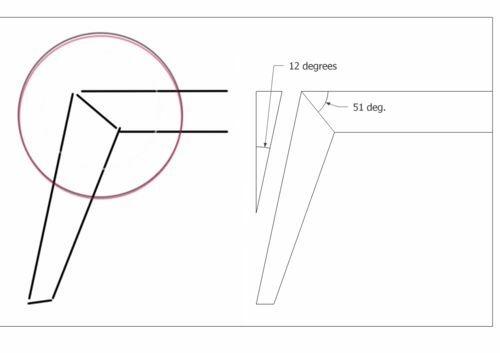 The miter angle for each piece would then be 51 degrees. In order to cut a 51 degree miter, you would set your miter saw or tilt your table saw to 39 degrees (because miter gauges read 90 degrees off from their actual angles—-don’t ask me why). If you are trying to miter pieces of different dimensions, than the angles will change and will depend upon the dimensions of the pieces. keepin it simple sure takes out the complicated stuff and makes it,welp, simple! i might be mistaken, but with the 62 degrees at the joint, i think the bottom cut on the leg( if its a leg) should be 28 degrees? The image has no dimensions so you can’t calculate anything. If I were you, I would make a 1:1 model out of cardboard and then measure the angles and dimensions you want. I’m with you make it out of card board first.